When Is a Tennessee Hotel Liable for a Guest’s Slip-and-Fall Accident? Millions of people visit Tennessee each year on business or vacation. And when you stay in a local hotel or motel, there is a reasonable expectation your room will be safe and free of significant safety hazards. Of course, that is not always the case, and when someone is injured as the result of a hotelier’s negligence, the victim may bring a personal injury claim for premises liability. Keep in mind that no property owner, not even a hotelier, is automatically liable for every injury that occurs on their premises. Among other things, Tennessee law requires proof causation–that is to say, the hotelier’s negligence led to the accident that caused the victim’s injuries. In some cases, the evidence may show the hotelier created or caused the hazard itself; in others, it may be the hotelier had “actual or constructive” notice of a hazard created by someone else that it failed to properly remedy. Here is an illustration of what courts look for in these cases. This is taken from a recent decision in a pending federal lawsuit, Seymour v. LQ Management, LLC. Federal courts often hear personal injury claims when the parties are citizens of different states, e.g. a Virginia resident sues a Tennessee corporation. But the federal judge will apply the substantive law of the forum state, i.e. where the alleged injury took place. In this particular case, the plaintiff traveled to Tennessee and stayed at a La Quinta Inn and Suites in Franklin. During his stay, the plaintiff allegedly slipped and fell on a wet floor in his hotel room, which was Room 103. He subsequently sued the hotel’s owner, alleging its negligence caused the wet floor. The defendants deny causing the wet floor or having actual or constructive knowledge of the hazard prior to the accident. On this basis the defense filed a motion for summary judgment, arguing the plaintiff failed to allege sufficient facts to prove causation. The judge overseeing the case denied the motion. The hotel’s general manager also testified that the leak in Room 403–actually, a leak in the roof above the room-remained for “several months” after the plaintiff’s accident. The manager also confirmed that water had leaked down into Rooms 303 and 203 in the months following the accident, and that it “could have” gone all the way down into Room 103. Based on all this, the judge said a jury could find the defendants responsible for the plaintiff’s accident. 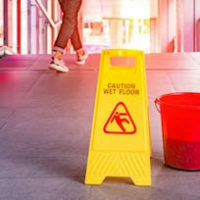 Premises liability claims like the one described above usually require an extensive amount of pre-litigation investigation. This is why it is critical to contact a qualified Nashville personal injury lawyer as soon as possible following an accident. Call the offices of Fox & Farley, Attorneys at Law, at 866-862-4855 if you need to speak with a lawyer today.